Autism and Asperger Syndrome have been combined into a new category scientists call Autism Spectrum Disorder, or ASD. Within that umbrella, 1 in 59 children are diagnosed with the disorder. (1) CDC’s Autism and Developmental Disabilities Monitoring (ADDM) Network also estimates that ASD is 4 times more common among boys than girls, and it is reported in all demographics. Each sign ranges within age and severity varies. The education on this is that some children show signs within their first few months, while others may not show until the ages of 3 or 4. If a child shows the one or more of the following symptoms, it is recommended that they see a pediatrician. Level 1: Requires Support - Difficulty initiating social interactions. Organization and planning difficulties can hinder independence. Level 2: Requires Substantial Support Social - Interactions are limited to narrow topics and special interests. Frequent repetitive/restricted behaviors. Level 3: Requires Very Substantial Support - Severe deficits in verbal and non verbal skills. Organization and planning difficulties can hinder independence. While the creation of levels is important when helping to identify, the classification can be subjective. Our mission is to help you and those who are closely related to Autism Spectrum Disorder. The early the intervention, the better. (5) In the next ten years, over 500,000 teens on the spectrum will become adults and age out of school-based ASD services. (6) Therefore, the need for awareness is crucial for continued research and treatments, especially since early treatment and therapy can help the behavioral and social skills for a child with autism. Autism Speaks is responsible for the international events “Light It Up Blue” and the Autism Speaks Walk program. This walk is the largest fundraiser event for autism awareness, which has raised over $300 million towards advocacy, research, and services for those with the condition. April is the month to celebrate ASD awareness, with April as National Autism Awareness Month, and April 2nd as National Autism Awareness Day. Many charities and organizations will host events, fundraisers, and promote campaigns to bring attention to ASD. The autism awareness colors represented by ASD include blue, and multi-colored puzzle pieces, which was created by the Autism Society. 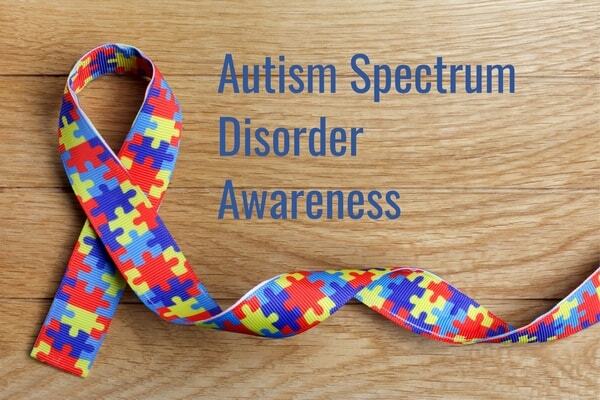 These ASD ribbons have a noticeable pattern that represents the complexity of the spectrum disorder, with each shape and color reflecting the diversity of the families associated with the disorder. Demonstrating your support in your community is easy. Besides donating to charity, participating in runs, or raising money for the cause, colorful bumper stickers, t-shirts, and silicone bracelets or wristbands are excellent ways to show your advocacy. You can decorate your blue or multi-colored puzzle reminder band today with rapidwristbands.com. The autistic world is a puzzle to us, and our world is puzzling to those on the spectrum. But just like any other illness or disorder, Autism or Asperger Syndrome does not define the individual. It is merely just a part of who they are, not what they are. At the end of the day, no one is truly normal.